TORONTO (AP) — Greek teen Stefanos Tsitsipas upset Wimbledon champion Novak Djokovic 6-3, 6-7 (5), 6-3 on Thursday in the Rogers Cup. The 19-year-old Tsitsipas broke the ninth-seeded Serb’s serve early in the third set and held serve from there to reach his first career ATP World Tour Masters 1000 quarterfinal. Djokovic, a four-time Rogers Cup champion, faded late on a warm, breezy afternoon at Aviva Centre on the York University campus. 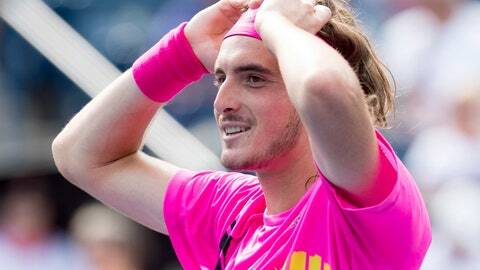 Tsitsipas set up match point with a scorching cross-court winner before completing the victory in 2 hours, 17 minutes. Top-ranked Rafael Nadal beat Swizterland’s Stan Wawrinka 7-5, 7-6 (4) in a night match delayed by rain late in the first set. Nadal, playing his first event since losing to Djokovic in the Wimbledon semifinals, will face sixth-seeded Marin Cilic of Croatia. Cilic beat 11th-seeded Diego Schwartzman of Argentina 6-3, 6-2. Tsitsipas will face second-seeded Alexander Zverev of Germany, the defending champion coming off a tournament victory last week in Washington that included a semifinal win over Tsitsipas. The 21-year-old Zverev beat Russia’s Daniil Medvedev 6-3, 6-2 for seventh straight match win and tour-high 43rd of the year. Fourth-seeded Kevin Anderson of South Africa and fifth-seeded Grigor Dimitrov of Bulgaria set up another quarterfinal. Anderson topped qualifier Ilya Ivashka of Belarus 7-5, 6-3, and Dimitrov beat American Frances Tiafoe 7-6 (1), 3-6, 7-6 (4). In the other quarterfinal, Karen Khachanov of Russia will play Robin Haase of the Netherlands. Khachanov beat eighth-seeded John Isner of the United States 7-6 (5), 7-6 (1), and Haase topped Canadian Denis Shapovalov 7-5, 6-2.